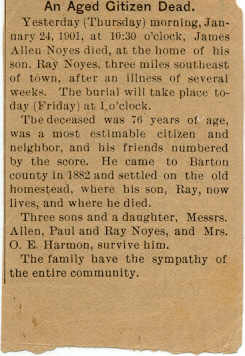 Yesterday (Thursday) morning, January 24, 1901, at 10:30 o’clock, James Allen Noyes died, at the home of his son, Ray Noyes, three miles southeast of town, after an illness of several weeks. The burial will take place today (Friday) at 1 o’clock. The deceased was 76 years of age, was a most estimable citizen and neighbor, and his friends numbered by the score. He came to Barton county in 1882 and settled on the old homestead, where his son, Ray, now lives, and where he died. Three sons and a daughter, Messrs. Allen, Paul and Ray Noyes, and Mrs. O. E. Harmon, survive him. The family have the sympathy of the entire company.